GO ECO is an interactive installation that illuminates the different perspectives of several participants involved in a wetland preservation project. The concept is metaphorically based on the ancient Asian game of Go, (originally, one of the Four Arts of China along with music, painting, and poetry) which uses strategies to capture territory through balancing tactics. One ecosystem has spawned yet another – the wildlife, plants, and predators have generated a parallel web of interdependence that encompasses politics, conservation hierarchies, and real estate interests. GO ECO also functions as an informational “serious game” installation of video vignettes. Digitally manipulated images with sound are projected in quadrants on the screen to lead players through to the next move. 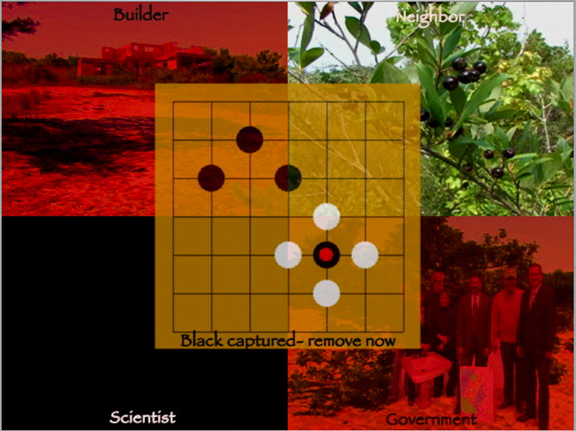 The viewpoints of biologists, landowners, government officials, and neighbors are activated by moving the “stones” on the game board. A camera sensor placed above transmits the actual moves to the computer. Any number can play, but odd numbers of players (1, 3, or 5) are preferable as in the game of Zen Go. Cooperation is encouraged – you must see the other side’s point of view since you will be the other side on your next turn. The final outcome of the game is determined by the teamwork of players making their way toward a solution that enables all sides to win or to lose together. GO ECO addresses questions that apply to many locations in coastal areas, though it is inspired by an artist initiated community project to preserve a 12-acre wetland in Southold, NY. This globally rare “”Maritime Freshwater Interdunal Swale”” includes native cranberries, varied wildlife, and the endangered IRIS PRISMATICA that are all being threatened by development. GO ECO allows players of many ages to be empowered and learn about the issues through an art experience that maps paths of action.